November 3, 1987. From the confluence of the Middle Fork and the South Fork to the point at elevation 1,595 feet above mean sea level. The Middle Fork from its headwaters at Lake Helen to its confluence with the main stem. The South Fork from its headwaters at Lake 11599 to its confluence with the main stem. Wild — 65.5 miles; Recreational — 15.5 miles; Total — 81.0 miles. The Kings Wild and Scenic River includes the entire Middle and South Forks and six miles of the Kings River. 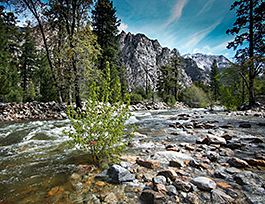 It flows through Kings Canyon National Park and the Sequoia and Sierra National Forests. Beginning in glacial lakes above timberline, the river flows by deep, steep-sided canyons, over falls and cataracts, eventually becoming an outstanding whitewater rafting river in its lower reaches in Sequoia National Forest. Geology, scenery, recreation, fish, wildlife and history are all significant aspects. The river traverses through the second deepest canyon in North America and offers tremendous scenery and recreation experiences. Kings Canyon Scenic Byway will take you to the eastern section of the river where you will find wilderness trailheads, Grizzly Falls picnic area and dispersed camping opportunities along the river's edge. Cave tours are available at Boyden Cavern, there is camping at Convict Flat Campground and some of the best fly fishing in California.